The story of the Three Musketeers, D'Artagnan, and the imprisonment in an iron mask of the identical twin of the King of France, Louis XIV. Jean-Louis Barrault ... Louis XI. 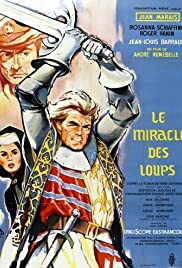 A remake of a silent movie of the twenties which is impossible to see nowadays,"le miracle des loups " (the title is right:the wolves really work a miracle here)is mainly a vehicle for Jean Marais's prowess.King of the swashbuckler genre in France in the 1955-1965 era,he was the hero of many a young French boy at the time. History is given a rough ride,but Louis the eleventh 's -a smart Jean -Louis Barrault- and Charles Le Téméraire's -a wicked Roger Hanin fight provides the story with a good background.Jeanne de Beauvais (Rosanna Schiaffino) is the king's goddaughter in love with knight Marais,but alas ,Le Téméraire covets her and kidnaps her. The scenes with the wolves were reportedly difficult to film;and the overblown "pacte des loups" stole the "animal justice " (and part of the title) from this little entertaining unpretentious movie from the early sixties,by veteran André Hunnebelle who had already directed the first version of "le bossu" a couple of years earlier.